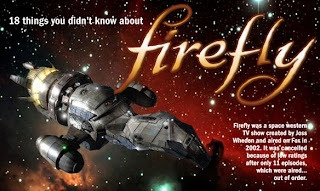 IF you're a fan of the scifi/western, Firefly, you may think you know everything about the show. Or maybe you're just a casual viewer. Or maybe you've never even seen the show. No matter what kind of browncoat you are, you'll probably find something to love with this infographic from Carsort. NOTE: This infographic was provided for informational purposes only. We don't endorse Carsort or its services, and have not been compensated in any way for presenting this information. What do you think of the infographic? Do you have any facts to share about the show? I'm surprised the body count in Serenity wasn't higher, especially with River's carnage at the end. I did know Roddenberry pitched Star Trek as a western in space. Never saw Outlaw Star. I guess I need to add it to my Anime collection.